Have you read Jacob Grant's Cat Knit?? It's one of the cutest books I've read all year! 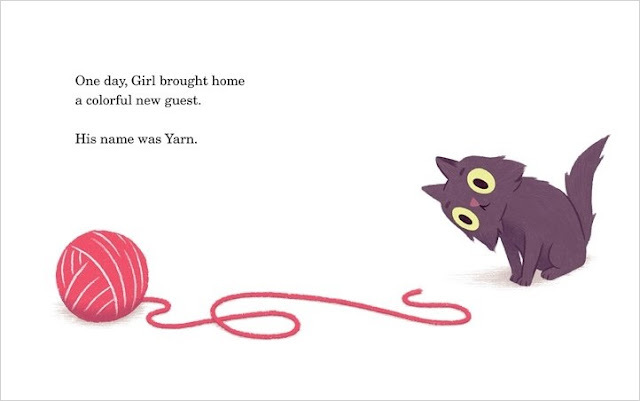 Basically there's a girl named Girl who gets her cat named Cat a new friend named Yarn. Things are going really well until Girl takes Yarn away one day and Yarn returns a little...different. Cat is just absolutely adorable, and I can't get enough of his eyebrows (aren't cats with eyebrows the best??). We see curiosity, disdain, and guilt portrayed so accurately, and there's a consistent tone of playfulness in every illustration. 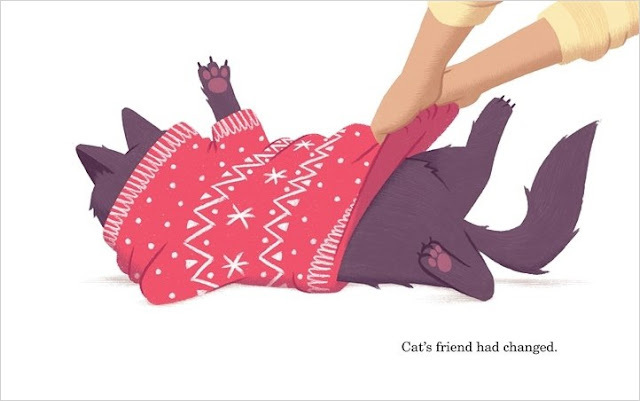 Cat is wonderfully expressive, and there's so much movement in each spread, that it's just as fun to read the illustrations as it is to read the words. There's an emotional narrative so we feel invested as we follow Cat on his small journey to ditch Yarn before realizing that maybe he wants it after all. The illustrations are charcoal and crayon with digital elements, so they look clean and solid. Grant often features one or two images on a white spread, but he always gives the depth to the space with shadow so that when we switch to the more detailed scenes we still feel like we're always in the same story. Cat Knit is well-designed from cover to cover, with beautiful endpapers and a perfect book case featuring Cat's sweater pattern.